Set in the heart of the US$30 billion Marina bay, Asia’s most exciting urban lifestyle hub, the 66- storey, 239-metre tall Marina Bay Suites sets new standards for exquisite luxury living in Marina Bay Fortunate residents will enjoy dynamic city skyline vistas and exclusive views of the elegant Central Linear park. An oasis of peace and tranquility in the heart of the new Downtown, the Central Linear park will serve as a ceremonial green focal point for the entire area. Wake up to the soothing greenery of the park and the cool breezes from the sparkling blue water of Marina Bay. Marina Bay Suites residents will also enjoy superb road and rail connections and easy access to the airport and the rest of Singapore. With direct road links to East Coast Parkway and the upcoming US$1.65 billion Marina Coastal Expressway, the international air link hub of Changi Airport is less than 18 minutes away. 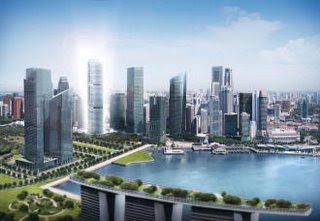 Residents will also have convenient access to Raffles Place and the rest of the Island via future MRT station. Nearby Amenities : Walking distance to CBD- Raffles Place, Garden by The Bay, Singapore Flyer, Bayfront Bridge, Marina Barrage, Marina Bay Sands Integrated Resort, Bussiness Financial Centre, Grand Prix Racing, Esplanade Theatres on The Bay.